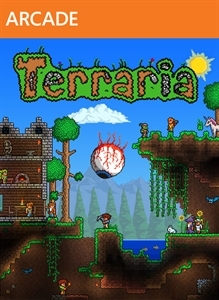 Terraria – Xbox 360 Edition. Welcome to the world of Terraria! DIG, FIGHT, EXPLORE, BUILD! Nothing is impossible in the special edition version of this action-packed sandbox adventure! Over a dozen environments and hundreds of items to craft and enemies to defeat! The world is your canvas – make it your own. Special edition content includes new tutorials, 2-4 player split-screen (HD only), 8 players online, new items, pets, enemies, and a brand new boss! Side-scrolling multiplayer RPG Terraria has sold more than 125,000 copies on Xbox 360 in its first week on sale -- the first title to outsell Minecraft's weekly sales in quite a while. For the week ended March 31, Terraria sold 127,944 in its opening week, compared to Minecraft's 81,205 sales during the same period, according to data from Gamasutra columnist and blogger Ryan Langley. Notably, Minecraft studio Mojang told Langley this week that the Xbox 360 version of the hit indie title saw more than 250,000 purchases in March, meaning that the company has sold more than 6 million copies of the console version.